Pssst.... I have a secret to tell you. For all you perfectionists out there, you're never going to get it perfect. As a fellow perfectionist personality, I know that we don't like to hear that statement. I certainly don't. It stinks. We can't get our little lives in perfect shape. Perfection is unattainable. Imperfection is going to have to be good enough. It's just going to have to be OK whether you like it or not. Whether it's being an imperfect person, producing an imperfect product, living an imperfect life, or writing an imperfect blog post, you are going to need to accept the reality of the situation and move ahead. Because of Adam and Eve's sin back in the Garden of Eden, we are all doomed to lives of imperfection. From Genesis 3 forward to the end, the Bible is a continuous narrative of one imperfect person after another. Noah and his family were the only one's considered righteous enough to be saved by God from the worldwide flood. After the flood, though, Noah planted a vineyard, made some wine from the grapes, and then got hammered in his tent. Abraham was God's chosen man to create a lasting covenant that would later be with the nation of Israel. On at least two separate occasions, Abraham misrepresented the truth about his wife, telling the Philistines that she was his sister. King David was an imperfect person. He screwed up in some pretty major ways. But, he always acknowledged that he messed up, confessed his sin, took God's punishment, and moved forward with God's calling on his life. Peter, fearing for his very life, denied that he even knew the Lord three times. Later on, Jesus restored him to his place of leadership among the apostles. Overcoming perfectionism can be a challenge for a lot of people. The key, though, is to acknowledge that you and I are imperfect. We are going to mess up a whole bunch. Once we do mess up, we need to just move forward in our imperfection. Simply acknowledge that we have made some mistakes, ask God to forgive us, and then get back up and keep going. The people who have been truly successful have made some of the biggest mistakes. The only way they could be truly successful was to learn and grow from their mistakes. They don't get stuck in the past. They simply chalked it up to life experience, put one foot in front of the other, and kept on truckin'. I don't care how much you've messed up and God doesn't either. Learn, grow, edit, rewrite, and keep going. In closing, let me leave you with this excellent, lengthy quote that I ran across as I was doing some research on this imperfect post. Enjoy! Congratulations! You're not perfect! It's ridiculous to want to be perfect anyway. But then, everybody's ridiculous sometimes, except perfect people. You know what perfect is? 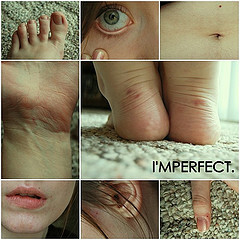 Perfect is not eating or drinking or talking or moving a muscle or making even the teensiest mistake. Perfect is never doing anything wrong - which means never doing anything at all. Perfect is boring! So you're not perfect! Wonderful! Have fun! Eat things that give you bad breath! Trip over your own shoelaces! Laugh! Let somebody else laugh at you! Perfect people never do any of those things. All they do is sit around and sip weak tea and think about how perfect they are. But they're really not one-hundred-percent perfect anyway. You should see them when they get the hiccups! Phooey! Who needs 'em? You can drink pickle juice and imitate gorillas and do silly dances and sing stupid songs and wear funny hats and be as imperfect as you please and still be a good person. Good people are hard to find nowadays. And they're a lot more fun than perfect people any day of the week. - Stephen Manes, from Be a Perfect Person in Just Three Days!